Research Center, National Zoological Park, Smithsonian Institution, Front Royal, VA 22630. Published online 16 June 2008 in Wiley InterScience (www.interscience.wiley.com). related phenomenon. Zoo Biol 28:1–15, 2009.
but rather both physiological and psychological conditions probably are involved. 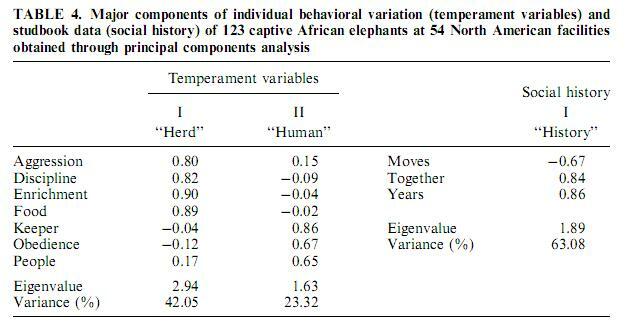 environmental factors differ between captive and free-living elephants. acquired from the National Oceanic and Atmospheric Administration (NOAA). categorized as ‘‘noncycling’’ [Brown et al., 2004b]. years; (4) number and experience of keeper staff; and (5) makeup of the elephant diet[Freeman, 2005]. than focusing on a specific year(s). determine the link between the captivity-related factors and ovarian acyclicity. (i.e. noncycling or cycling) from one or more independent variables [Demaris, 1992]. surveys were returned describing the captive environment of 113 females (Table 3). 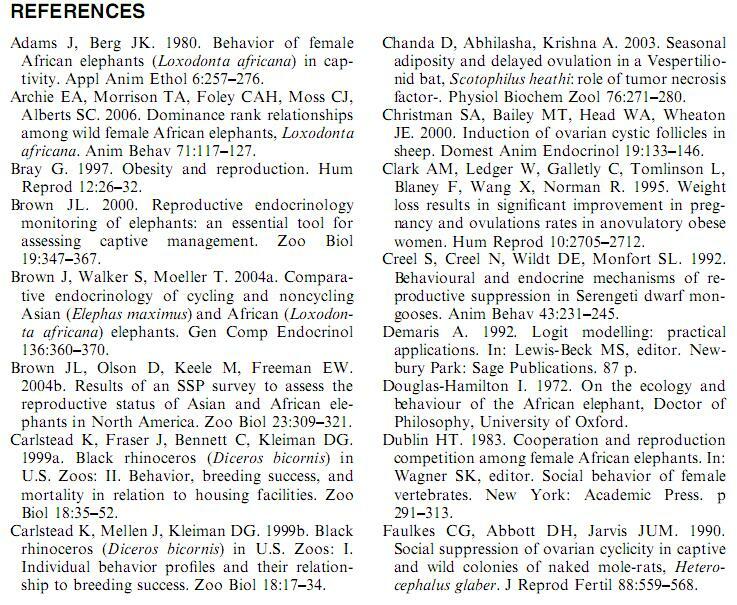 undetermined elephants, they were excluded from subsequent data analyses. and accounted for 63.08% of variance in the data. negative correlation to the number of males and changes to the herd structure. precipitation and females, but a negative correlation with history and management. a multiple logistic regression was run on the remaining model variables (Table 6). cohorts are more likely to be acyclic. et al., 2003], sheep [Christman et al., 2000] and rats [Marin-Bevins and Olster, 1999]. storage of adipose tissue [Wade et al., 1996]. female African elephants that live in strongly bonded family groups of related cows. Hamilton, 1972; Dublin, 1983; McComb et al., 2001; Poole and Moss, 1989]. In some aspects, captive elephant social groups resemble those in the wild. 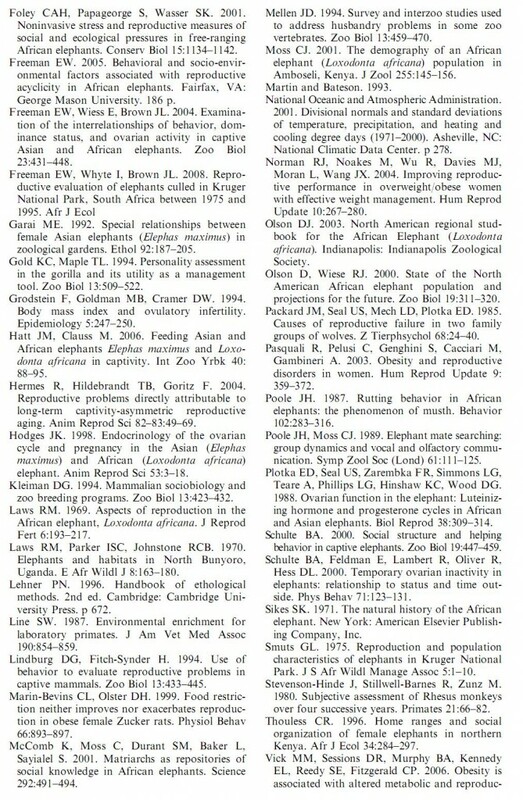 history with a specific reproductive problem in elephants. North America popula tion, albeit at a younger age. temperature, both of which are correlated with time spent indoors in the winter[Freeman, 2005]. that transferring elephants should not affect long-term cyclicity status. normal ovarian activity, although none have been proven to be effective as yet[Brown et al., 2004a]. 2. The majority of acyclic females hold a dominant social status within the herd. 3. BMI was the only health-related factor associated with ovarian acyclicity. 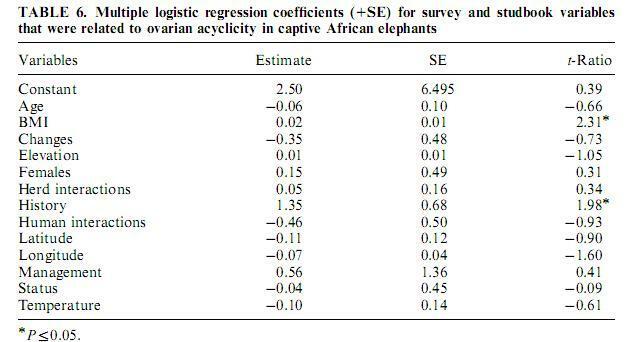 Controlling weight of acyclic elephants may help reinitiate normal cyclicity. We thank the 54 facilities that completed one or more of the elephant surveys. Friends of the National Zoo and the International Elephant Foundation.